in terms of responsiveness, flexibility and job satisfaction. ROGER SIMPSON IS typical of small business owners. He started working in corporates – in his case internationally with Shell – but found small business suited him better. Simpson is the owner and chief executive of the Australian company The Retail Solution, which specialises in coaching, customer service and selling skills in the retail sector. 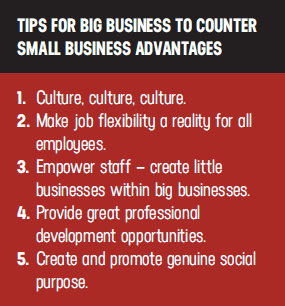 He notes three key advantages a smaller company has over a large organisation. “Firstly, there is the ability to follow a passion and get paid for it,” Simpson says. Secondly, a small business owner can create and develop their own culture, not be captured by someone else’s Thirdly, there is the freedom to set one’s own hours. “Small business is such that once you taste success, it’s hard to go back (to corporates),” Simpson says. It’s a sentiment echoed by Wendy Brackenridge, co-owner of Auckland-based Mrs Higgins Cookies. 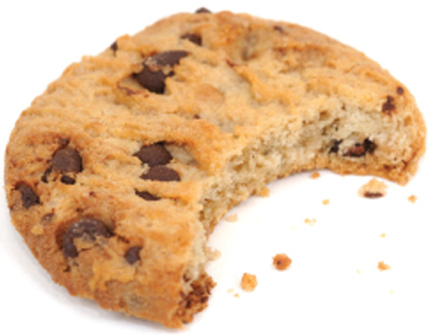 The company sells cookies and baking accessories through multiple outlets in New Zealand and Australia. But it’s not just the owners who feel this way about their businesses. Brackenridge notes that it is possible to build a strong team culture in a small business that leads to job satisfaction among staff and a willingness to give more to the company. Brackenridge says that small businesses also have it over their corporate rivals when it comes to being responsive to customers. Mrs Higgins reacts speedily to new product development opportunities and delivers quickly. “Because we are small, customers view us as a niche and specialist producer of a gourmet cookie which is lovingly crafted rather than as a mass producer of biscuits. This has opened doors for us to customers seeking a more specialist product,” Brackenridge says. We hold discussions amongst ourselves, make decisions, and get on with it, rather than waiting for a board to meet and make decisions, and all the politics that goes with that. For Tait Grindley, general manager strategy and performance at the Institute of Management, New Zealand, it is this ability to be nimble in delivering what customers want that really sets small businesses apart. “The advantages of small business are best looked at from the customer viewpoint,” Grindley says. Large businesses can sometimes take a “cookie cutter” approach, while small businesses are better at adapting to ensure customers get what they want, Grindley says. Emma Dumas, founder of The Muesli, a Victorian company offering high quality, sugar-free muesli in Australia and New Zealand, picks flexibility, positive culture and the opportunity to work ethically as three main advantages of working in a small business. Thirdly, Dumas believes small business has the advantage of allowing owners to create their own culture. Dumas is not alone in observing that many women have been subject to misogynistic cultures in corporates. Small business can be an escape from that, she says. Lalitha Ashokkumar FCA is founder and CEO of Sydney-based RightAccountant.com.au, which matches clients with accountants. She deals with a lot of small accounting firms and says smaller firms have an advantage in being able to work closely and responsively with a client. “They can provide a personalised service, for example offering business health checks, not just the exact thing asked for. They can look for ways to add value to the client beyond the clients’ immediate service needs,” Ashokkumar says. Sydney-based Kate Engler, known as “the publicity princess”, specialises in connecting and getting small business owners “free” coverage in mainstream media. She says small businesses are good at being nimble and responding quickly to coverage opportunities for their business. “Today’s 24/7 news cycle demands instant responses,” Engler says. For herself, Engler highlights small business work life balance as a significant advantage. And Engler emphasises the value of being able to create a positive workplace culture. Linley Watson is founder and managing director of Peak Performance International. The company trains corporate teams in Australia and New Zealand. “While it’s true that small companies have some advantages over larger companies, shrewd corporate leaders are aware that they need to be more agile, flexible, innovative, collaborative, customer-centric and inclusive. They are purposely cultivating cultures that support this – ‘new way’ of working,” Watson says. Larger organisations can have the advantage when it comes to engaging their people. For example, many invest in business practices and technology that enable flexible work options. They also provide personal and professional development opportunities that smaller companies often can’t even consider. Increasingly people want to be engaged with a higher purpose and contribute to their community through their work. Larger organisations can mobilise their resources to make a significant difference. PAUL SOUTHWICK is a freelance journalist, corporate writer and business consultant.